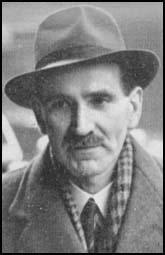 William Skardon worked for Special Branch during the Second World War. After the war Skardon joined MI5 where he became the organizations chief investigator. On 5th September 1945, Igor Gouzenko, a KGB intelligence officer based in Canada, defected to the West claiming he had evidence of an Soviet spy ring based in Britain. Gouzenko provided evidence that led to the arrest of 22 local agents and 15 Soviet spies in Canada. Some of this information from Gouzenko resulted in Fuchs being interviewed by Skardon. Fuchs denied any involvement in espionage and the intelligence services did not have enough evidence to have him arrested and charged with spying. However, after repeated interviews with Skardon he eventually confessed on 23rd January 1950 to passing information to the Soviet Union. Skardon also interviewed Kim Philby, Anthony Blunt and John Cairncross. William Skardon died in 1987. On one floor Jim Skardon, the Head of the Watchers, had his office. Skardon was a dapper, pipe-smoking former policeman. He had originally been a wartime MIS interrogator, and in the immediate post-war period had been the chief interrogator in a number of important cases, particularly that of Klaus Fuchs. Skardon had a high opinion of his own abilities, but he was an immensely popular man to work for. There was something of the manner of a trade union shop steward about him. He felt that the Watchers did arduous and difficult work, and needed protection from exploitation by hungry case officers back at Leconfield House. In a sense this was true. There were around a hundred Watchers when I joined the Service, but the demand for their services was unquenchable in every part of MI5's activity. But I soon came to feel that Skardon was not facing up to the modern reality of watching on the streets of London. It was quite clear that the Russians, in particular, operated very extensive countersurveillance to prevent their agents from being followed. Having watched the system for a few weeks I doubted that the Watchers, using their current techniques, had any realistic chance of following anyone without speedy detection. We have had Fuchs' activities under intensive investigation for more than four months. Since it has been generally agreed that Fuchs' continued employment is a constant threat to security and since our elaborate investigation has produced no dividends, I should be grateful if you would be kind enough to arrange for Fuchs' departure from Harwell as soon as is decently possible. He was obviously under considerable mental stress. I suggested that he should unburden his mind and clear his conscience by telling me the full story. He (Fuchs) said: 'I will never be persuaded by you to talk." At this stage we went to lunch. During the meal he seemed to be resolving the matter and to be considerably abstracted... He suggested that we should hurry back to his house. On arrival he said that he had decided it would be in his best interests to answer my questions. I then put certain questions to him and in reply he told me that he was engaged in espionage from mid 1942 until about a year ago. He said there was a continuous passing of information relating to atomic energy at irregular but frequent meetings. I was a student in Germany when Hitler came to power. I joined the Communist Party because I felt I had to be in some organization. I was in the underground until I left Germany. The Communist Party said that I must finish my studies because after the revolution in Germany people would be required with technical knowledge to take part in the building of the Communist Germany. I went first to France and then to England, where I studied and at the same time I tried to make a serious study of the bases of Marxist philosophy. I had my doubts for the first time (August, 1939) on acts of foreign policies of Russia; the Russo-German pact was difficult to understand, but in the end I did accept that Russia had done it to gain time, that during the time she was expanding her own influence in the Balkans against the influence of Germany. Shortly after my release (from detention as an enemy alien) I was asked to help Professor Peierls in Birmingham, on some war work. When I learned the purpose of the work I decided to inform Russia and I established contact through another member of the Communist Party. Since that time I have had continuous contact with the persons who were completely unknown to me, except that I knew they would hand whatever information I gave them to the Russian authorities. At that time I had complete confidence in Russian policy and I believed that the Western Allies deliberately allowed Russia and Germany to fight each other to the death. I had therefore, no hesitation in giving all the information I had, even though occasionally I tried to concentrate mainly on giving information about the results of my own work. There is nobody I know by name who is concerned with collecting information for the Russian authorities. There are people whom I know by sight whom I trusted with my life. (5) Robert Lamphere, an FBI Agent who worked on the Klaus Fuchs case with William Skardon, was interviewed about this in 1999. Skardon was a very down-to-earth Britisher, not upper-class at all, but a very convincing interrogator. A man that I liked at first, I respected the job he'd done in convincing Fuchs' to co-operate initially.